Bruce reviewing his troops before the battle. The Battle of Bannockburn (Blàr Allt a' Bhonnaich in Gaelic) (June 24, 1314) was a significant Scottish victory in the Wars of Scottish Independence. It was the decisive battle in the First War of Scottish Independence. The Wars of Scottish Independence were a series of military campaigns fought between the Kingdom of Scotland and the Kingdom of England in the late thirteenth and early fourteenth centuries. The First War (1296–1328) began with the English invasion of Scotland in 1296, and ended with the signing of the Treaty of Edinburgh-Northampton in 1328. The Second War (1332–1357) began with the English-supported invasion of Edward Baliol and the "Disinherited" in 1332, and ended in 1357 with the signing of the Treaty of Berwick. The wars were part of a great national crisis for Scotland and the period became one of the most defining moments in the nation's history. At the end of both wars, Scotland retained its status as an independent nation, at least nominally, until the unification of the throne in 1603. The wars also saw other important developments, such as the emergence of the longbow as a key weapon in medieval warfare. Around Lent of 1314 Edward Bruce, brother of the Scottish king, began the siege of Stirling Castle, which was commanded by Sir Philip Mowbray. Unable to make any headway, Bruce agreed to a pact with Mowbray; if no relief came by midsummer 1314, the castle would surrender to Bruce. By this arrangement, Bruce may have believed that he had bought a cheap victory; it had been two years since an English army had come to Scotland, and King Edward II of England had recently been on the verge of war with his barons after the murder of Piers Gaveston in the summer of 1312. Stirling was of vital strategic importance and its loss would be a serious embarrassment to the English. The time allowed in the Bruce-Mowbray pact was ample for Edward to gather a powerful army. According to the historian and poet John Barbour, King Robert Bruce rebuked the folly of his brother, even though Dundee had probably fallen to the Scots through a similar arrangement in 1312. Mowbray had a breathing space and looked forward to the summer of 1314. In England, Edward and his barons reached an uneasy peace and made ready. Edward II came to Scotland in the high summer of 1314 with the notional aim of relieving Stirling Castle: the real purpose, of course, was to find and destroy the Scottish army in the field, and thus end the war. England, for once, was largely united in this ambition, although some of Edward's greatest magnates and former enemies, headed by his cousin, Thomas of Lancaster, did not attend in person, sending the minimum number of troops they were required by feudal law. Even so, the force that left Berwick-upon-Tweed on June 17, 1314 was impressive: it comprised between two and three thousand horses (likely closer to two thousand) and sixteen thousand foot soldiers, at least two or three times the size of the army Bruce had been able to gather. Edward was accompanied by many of the seasoned campaigners of the Scottish wars, headed by the Earl of Pembroke, and veterans like Henry de Beaumont and Robert Clifford. The most irreconcilable of Bruce's Scottish enemies also came: Ingram de Umfraville, a former Guardian, and his kinsman the Earl of Angus, as well as others of the MacDougalls, MacCanns and Comyns. Most poignant of all came Sir John Comyn of Badenoch, the only son of the Red Comyn, who was born and raised in England and was now returning to Scotland to avenge his father. This was a grand feudal army, one of the last of its kind to leave England in the Middle Ages. 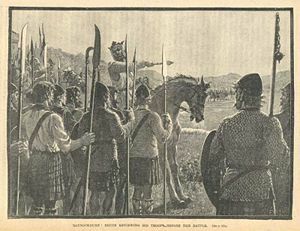 King Robert awaited its arrival south of Stirling near the Bannock Burn in Scotland. 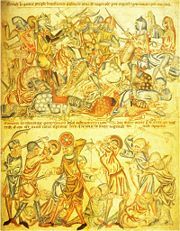 A depiction of the Battle of Bannockburn from the Holkham Bible, 1327-35. The English army marched rapidly towards Stirling to be there before Mowbray's agreement expired on June 24. Edinburgh was reached on the 19th and by the 22nd it was at Falkirk, only 15 miles short of its objective. Edward's host followed the line of the old Roman road, which ran through an ancient forest known as the Tor Wood, over the Bannock Burn and into the New Park, a hunting preserve enclosed at the time of Alexander III. Bruce's army had been assembling in the Tor Wood, an area providing good natural cover, from the middle of May. On Saturday June 22, with his troops now organized into their respective commands, Bruce moved his army slightly to the north to the New Park, a more heavily wooded area, where his movements could be concealed and which, if the occasion demanded, would provide cover for a withdrawal. Bruce's army, like William Wallace's before him, was chiefly composed of infantry armed with long spears. It was probably divided into three main formations. Thomas Randolph, 1st Earl of Moray, commanded the vanguard, which was stationed about a mile to the south of Stirling, near the church of St. Ninians, while the king commanded the rearguard at the entrance to the New Park. His brother, Edward, led the third division. According to Barbour only, there was a fourth nominally under the youthful Walter the Steward, but actually under the command of Sir James Douglas. Bruce also had a cavalry force of some 500 men-at-arms under Sir Robert Keith, which was to play a small but crucial role in the coming battle. In an eighteenth century romance version of the Bruce Legend, the Knights Templar distinguished themselves at the Battle of Bannockburn on the Scottish side; however this is unquestionably a later addition (c. 1700) to the account. Bruce was at that time excommunicated and the Templar Order had recently been dissolved in most of Europe, so a common speculation developed that many Templars had fled to Scotland to be away from Papal control. The army might have numbered as many as 9000 men in all, but probably more of the order of 6000-7000. It was gathered from the whole of Scotland: knights and nobles, freemen and tenants, town dwellers and traders: men who could afford the arms and armor required. Barbour claims that King Robert turned away those who were not adequately equipped. For most such equipment would consist of a spear, a helmet, a thick padded jacket down to the knees and armored gloves. It is highly probable that a large proportion of the spearmen would have acquired more extensive armor given that the country had been at war for nearly 20 years. The balance of the army consisted of archers and men-at-arms. Each of these troop types was indistinguishable from their counterparts in France or England. Many of the Scottish men-at-arms (recruited from the nobility and the more prosperous burgesses) served on foot at Bannockburn. Since his landing at Ayrshire in 1307, King Robert had demonstrated repeatedly that he was willing to take risks but these were always measured and calculated. He had no intention of chancing all on the outcome of a day, as William Wallace had at the Battle of Falkirk. Almost to the last minute he was prepared to withdraw. He was persuaded to remain by news of the poor state of morale in the English army. But undoubtedly the most important factor in persuading him to make a stand was the ground which lay before him. With the trees of the New Park covering Bruce's army to the west, the only approach apart from the Pows to the east was directly over the old road from Falkirk. If this route, virtually the only solid ground on which heavy cavalry could deploy freely, were to be denied to the English, they would have no choice but to wheel right to the north-east, on to the Carse. 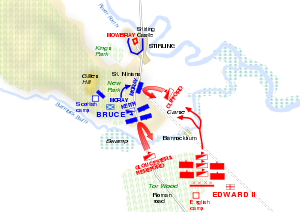 To force Edward to take this route Bruce adopted tactics similar to those he had used at the Battle of Loudon Hill: both sides of the road were peppered with small pits or 'pots', each three feet deep and covered with brush, which would force the enemy to bunch towards the center of a dangerously constricted front. Once on the Carse the English army would be caught in a kind of natural vice, as the main action on June 24 was to show, with waterways to the north, east, and south. Such natural advantages were not easily obtained, and were unlikely to occur again. the Carse of Balquhiderock, about a mile and a half north-east of the traditional site, accepted by the National Trust as the most likely candidate. It was on the old road that the preliminary actions of the Battle of Bannockburn took place on Sunday, June 23. For the English, things started to go wrong before the first blow had been struck. Sir Philip Mowbray, the commander of Stirling Castle, who had observed Bruce's preparations on the road, appeared in Edward's camp early in the morning, and warned of the dangers of approaching the Scots directly through the New Park. Mowbray also pointed out that there was no need to force a battle, as Edward was now close enough to the castle to constitute a technical relief according to the terms of the agreement with Edward Bruce. But even if the king was disposed to act on Mowbray's advice, it was already too late; for he was showing signs of losing control of his formidable but unwieldy host. The vanguard under the earls of Gloucester and Hereford, appointed to joint command by Edward after a quarrel about who would take the lead—a compromise that satisfied no one—were already closing in on the Scots from the south, advancing in the same reckless manner that had almost brought disaster at Falkirk. Following the line of the Roman road, they crossed the ford over the Bannock Burn towards King Robert's division at the opening of the New Park. Then one of the most memorable episodes in Scottish history occurred. Sir Henry de Bohun, nephew of the Earl of Hereford, was riding ahead of his companions when he caught sight of the Scottish king himself. De Bohun lowered his lance and began a charge that carried him out of history and into legend. King Robert was mounted on a small palfrey and armed only with a battle-axe. He wore no armor. As de Bohun's great war-horse thundered towards him he stood his ground, watched with mounting anxiety by his own army. With the Englishman only feet away Bruce turned aside, stood in his stirrups and hit the knight so hard with his axe that he split his helmet and head in two. This small incident became in a larger sense a symbol of the war itself: the one side heavily armed but lacking agility; the other highly mobile and open to opportunity. Rebuked by his commanders for the enormous risk he had taken, the King only expressed regret that he had broken the shaft of his axe. Cheered by this heroic encounter, Bruce's division rushed forward to engage the main enemy force. For the English, so says the author of the Vita Edwardi Secundi ("Life of Edward II"), this was the beginning of their troubles. After some fierce fighting, in which the Earl of Gloucester was knocked off his horse, the knights of the vanguard were forced to retreat to the Tor Wood. The Scots, eager to pursue, were held back by the command of the king. In the meantime, another English cavalry force under Robert Clifford and Henry de Beaumont skirted the Scottish position to the east and rode towards Stirling, advancing as far as St. Ninians. Bruce spotted the maneuver and ordered Randolph's schiltron to intercept. Randolph's action was to be a sampler of the main contest the following day: unsupported by archers, the horsemen were unable to make any impression on the Scots spearmen, precisely what happened in the opening stages of Falkirk. But the difference now was that the schiltrons had learnt mobility and how to keep formation at the same time. The English squadron was broken, some seeking refuge in the nearby castle, others fleeing back to the army. The captives included Sir Thomas Gray, whose son and namesake was later to base his account of the Battle of Bannockburn in his book, the Scalacronica, on his father's memories. The English army was still approaching Stirling from the south. Bruce's preparations had made the direct approach to Stirling too hazardous. Edward made the worst decision of all: he ordered the army to cross the Bannock Burn to the east of the New Park. Not long after daybreak on June 24, the Scots spearmen began to move towards the English. Edward was most surprised of all to see Robert's army emerge from the cover of the woods. As Bruce's army drew nearer they paused and knelt in prayer. Edward is supposed to have said in surprise, "They pray for mercy!" "For mercy, yes," one of his attendants replied, "But from God, not you. These men will conquer or die." One of the English earls, Gloucester, asked the king to hold back, but the king accused him of cowardice. Angered, the earl mounted his horse and led the vanguard on a charge against the leading Scots spearmen, commanded by Edward Bruce. Gloucester, who according to some accounts had not bothered to don his surcoat, was killed in the forest of Scottish spears, along with some of the other knights. The very size and strength of the great army was beginning to work against the King, as his army could not move quickly and lost a lot of time in getting into position. Bruce then committed his whole Scots army to an inexorable bloody push into the disorganized English mass, fighting side by side across a single front. A small force of archers added to the misery in Edward's army, which was now so tightly packed that if a man fell he risked being immediately crushed underfoot or suffocated. The knights began to escape back across the Bannock Burn. With the English formations beginning to break, a great shout went up from the Scots, "Lay on! Lay on! Lay on! They fail!" This cry was heard by Bruce's camp followers, who promptly gathered weapons and banners and charged forward. To the English army, close to exhaustion, this appeared like a fresh reserve and they lost all hope. The English forces north of the Bannock Burn broke into flight. Some tried to cross the River Forth where most drowned in the attempt. Others tried to get back across the Bannock Burn but as they ran “tumbling one over the other” down the steep, slippery banks, a deadly crush ensued so that “men could pass dryshod upon the drowned bodies” . The end had come and Edward fled with his personal bodyguard. Edward's flight ended the remaining order in the army; panic spread and defeat turned into a rout. He arrived eventually at Dunbar Castle, from here he took ship to England. From the carnage of Bannockburn the rest of the army tried escape to the safety of the English Border, ninety miles to the south. Many were killed by the pursuing Scottish army or by the inhabitants of the countryside that they passed through. Historian Peter Reese says that, “only one sizeable group of men—all footsoldiers—made good their escape to England.” These were a force of Welsh spearmen who were kept together by their commander, Sir Maurice de Berkeley, and the majority of them reached Carlisle. Weighing up the available evidence, Reese concludes that “it seems doubtful if even a third of the footsoldiers returned to England." Out of 16,000 infantrymen, this would give a total of about 11,000 killed. The English chronicler Thomas Walsingham gave the number of English men-at-arms who were killed as 700 while 500 more men-at-arms were spared for ransom. The Scottish losses appear to have been comparatively light, with only two knights among those killed. The Scottish victory was complete and, although full English recognition of Scottish independence was not achieved until more than ten years later, Robert Bruce's position as king was greatly strengthened by the events at Bannockburn. In recent years a legend has developed that Robert I was saved at a critical juncture of the battle by a force of Knights Templar - a story with no foundation in the documents of the time. In 1329 Robert the Bruce died. His body is buried in Dunfermline Abbey, while his heart is buried in Melrose Abbey. His heart was to be taken on crusade eventually to the Holy Land, but only reached Moorish Granada, where it acted as a talisman for the Scottish contingent at the Battle of Teba. During the Battle, Douglas realized his imminent death and he is said to have thrown the casket containing Bruce's heart ahead of him into the Moorish lines and shouted "Onward braveheart, Douglas shall follow thee or die." A brave Scottish soldier fought his way through the lines and re-captured the small locked silver casket containing his heart, and brought it back to Scotland. He was knighted Sir Simon Lockhart of the Lee for his actions. 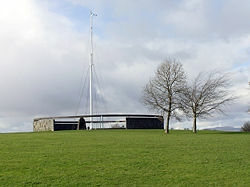 A modern, abstract monument stands in a field above the battle site, where the warring parties are believed to have camped on the night before the battle. The monument consists of two hemicircular walls depicting the opposing parties. Nearby stands the 1960s statue of Bruce by Pilkington Jackson. The monument, and the associated visitor center, is one of the most popular tourist attractions in the area. In 1932 the Bannockburn Preservation Committee, under Edward Bruce, 10th Earl of Elgin and Kincardine, presented lands to the National Trust for Scotland. Further lands were purchased in 1960 and 1965 to facilitate visitor access. "Bannockburn. Robert Bruce's Address to His Army" is the title of a patriotic poem by Robert Burns. The final scene of the Mel Gibson Epic film Braveheart shows Robert the Bruce, inspired by William Wallace's legacy, charging the English lines at Bannockburn. The chorus of Scotland's national anthem 'Flower of Scotland' refers to Scotland's victory over Edward and the English at Bannockburn. ↑ The Complete Works of Robert Burns at Project Gutenberg. Retrieved October 19, 2008. Maxwell, Herbert The Lanercost Chronicle. (original Glasgow: 1913) reprint The Chronicle Of Lanercost, 1272-1346 by Herbert Maxwell (Translator) Kessinger Pub., 2008. ISBN 1436592143. Christison, Philip. Bannockburn: the story of the battle. Edinburgh: The National Trust for Scotland, 1960. Hyland, Ann. The Warhorse 1250-1600. UK: Alan Sutton Publishing, Ltd. 1998. 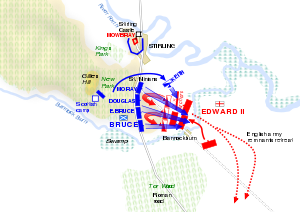 History of "Battle of Bannockburn"
This page was last modified on 16 May 2016, at 16:08.